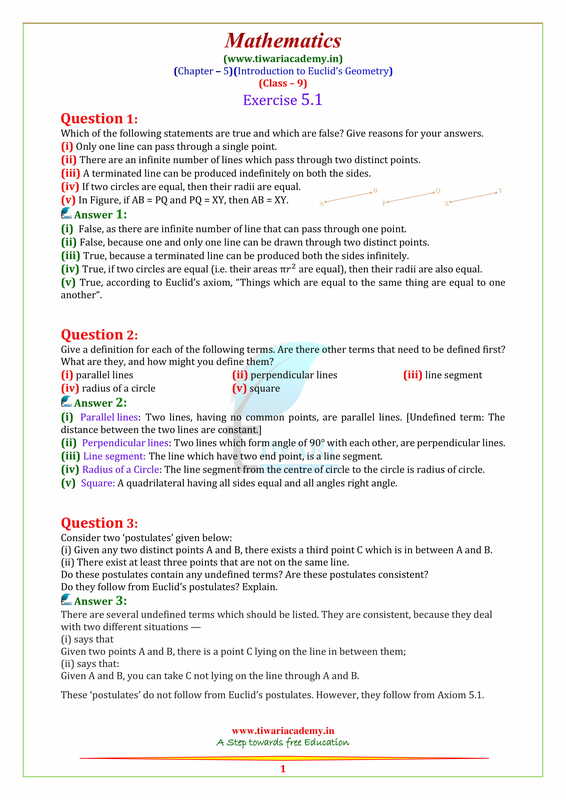 NCERT Solutions for Class 9 Maths Chapter 5 exercise 5.1 and 5.2 of introduction to Euclid’s geometry free in English Medium and Hindi Medium to use. 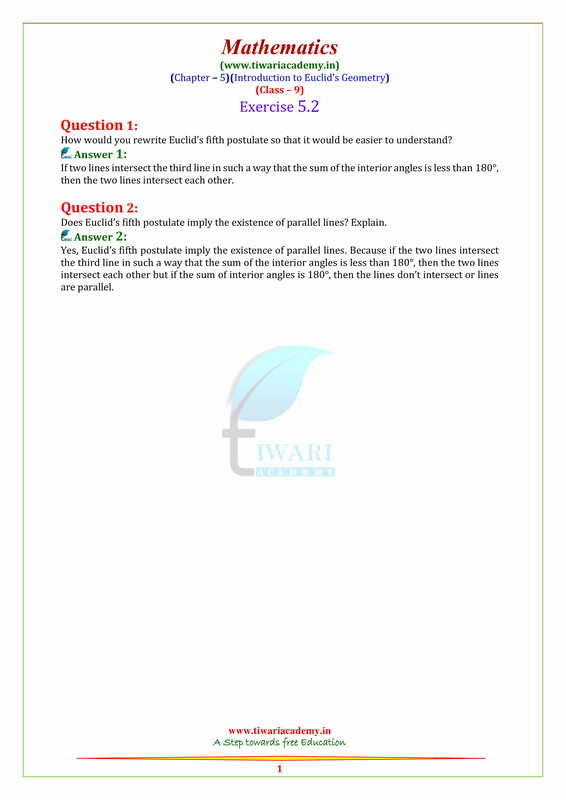 Class 9 Maths solutions with complete explanation for all chapter are given to download. Point: A Point is that which has no part. Line: A line is breadth less length. Straight Line: A straight line is a line which lies evenly with the points on itself. Surface: A surface is that which contain length and breadth only. Plane Surface: A plane surface is a surface which lies evenly with the straight lines on itself. Two distinct lines cannot have more than one point in common. Axiom or Postulates: Axiom or Postulates are the assumptions which are obvious universal truths. They are not proved. Theorems: Theorems are statements which are proved using definitions, axioms, previously proved statements and deductive reasoning. 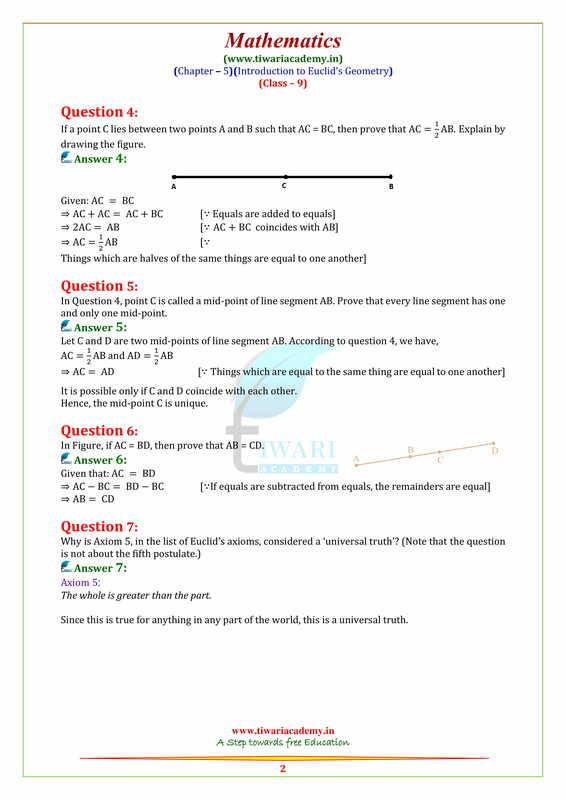 If A, B and C are three points on a line and B is between A and C then prove that AC – BC = AB. If x + y = 10 and x = z then show that z + y = 10. Prove that every line segment has one and only one mid-point. (a) only one line can pass through a single point. (b) There are infinitely many number of lines which passes through the two distinct point. An equilateral triangle is a polygon made up of three line segment out of which two line segments are equal to the third one and all the angles are 60° each. Can you justify that all sides and all angles are equal in equilateral triangle. RAM and Shyam are two students of Class IX. They give equal donation to a blind school in the month of March. In April each student double their donation. (a) compare their donation in April. Monika and Vasu have the same weight if they each gain weight by 2kg. How will their new weights be compared? (a) what values are depicted in this question?